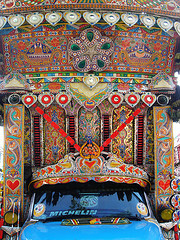 The truck art of Pakistan is eye catching, astonishing and very colorful. 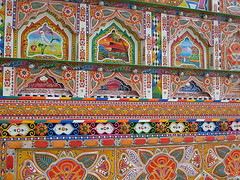 Truck painting art is indigenous art of Pakistan. The floral pattern, calligraphy, poetic verses, human depicts and catchy sentences written on it, make this truck art worth watching. In Pakistan, the owners of buses and trucks have been decorating their vehicles with great zeal for many years. These adorned trucks vehicles running on the roads, seems like a moving art. The owners, after purchasing their trucks, bring them to the truck art painters to get them painted and adorned. Each part of the truck is decorated with unique style; this unique style depends upon the taste and regional belonging of the owner and it costs him $3,000 to $5,000. The experts of truck art in Pakistan, claims that, just by looking at truck’s decorations, they can tell that which region the owner belongs to. 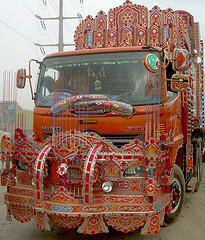 The trucks of Balochistan and Khyber Pakhtonkhawah, has a lot of wood trimming, trucks of Rawalpindi has plastic decoration on them, trucks of Karachi have reflective tapes, in rural Sindh, trucks are decorated with camel bones. Dr, Peter Grant, in 1995, saw this unique truck art of Pakistan and got amazed. He did some research on this art and according to him, the roots of this indigenous truck art of Pakistan goes back to the time of British Raj. The craftsmen used to decorate carriages drawn by horses, for the gentry. In 1920, the Kohistan bus company, asked Elahi Bukhsh, the master craftman, to decorate their buses to attract the passengers. Elahi Bukhsh employed a group of artists from Chiniot,a town of Punjab. The ancestors of these artists had worked on many palaces and temples, dated back to Moughal Empire. Later on, truck owners adopted this art for their trucks. A French doctor, Vincent Loos, painted his foxy with this truck art of Pakistan. He took a trip on his foxy from Islamabad to Paris, with his two friends, Dr.Haroon Khan and Salman Rashid. His foxy was named as “Foxy Shehzadi” means “foxy Princess”. @hummingbird5356: This is indeed a beautiful and eye catching art. when I see it here in Lahore I feel like an art running on roads. I hope you enjoyed your visit to Pakistan and brought back good memories. I appreciate you stopping by. Beautiful! I saw many of these trucks when I visited Pakistan. A very good hub. 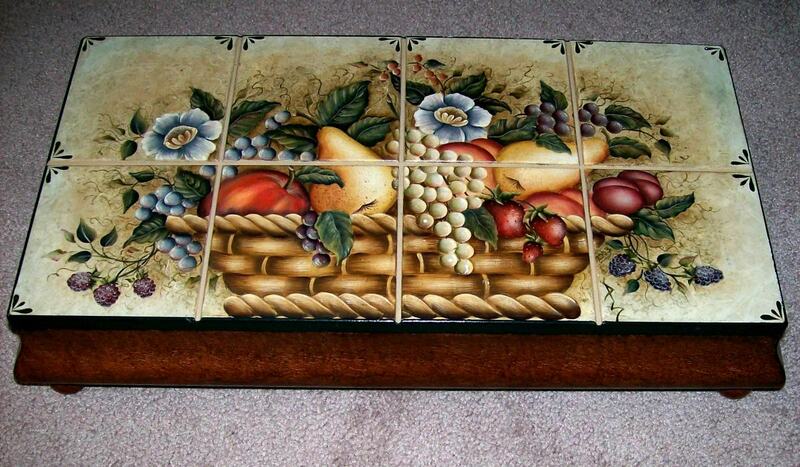 @Angela Brummer: thanks for stopping and commenting. I wish this beautiful art could reach your country also and make your roads beautiful with running art. 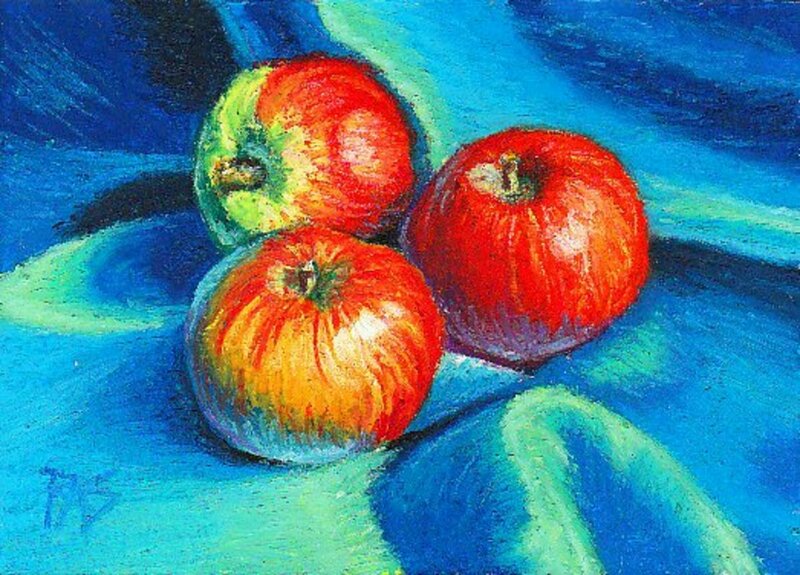 hi Nell,thank you very much for appreciating this indigenous art of pakistan. When you see them on road,it looks like a running art.thanks again for your valuable comment. alocsin thank you very much for stopping by and aprreciating.I would love to see the decoration of passenger jeepneys of philippines,that must have been exciting. This is quite fascinating and lovely. It reminds me of the decorating that the owners of passenger jeepneys do in the Philippines. Voting this Up and Beautiful. @Suhail and my dog: I am so glad to know that museum of Ottawa have a painted pakistani bus and you had the chance to take pictures of them,its really amazing and I am feeling proud of my culture. Thank you very much for stopping by and sharing your valuable experience. @Becky Katz:I will file a DMCA with google.this is very frustrating that they are copying everything from hubpages and hubpages are not taking any action against them. Becky thank you very much for doing such a favour and informing me with this issue. I am very grateful to you. A painted Pakistani Bus was run in Melbourne earlier and there is one housed in the Museum of Civilization in Ottawa. I was able to take lots of pictures of the bus in Ottawa hahaha. Very nice read. Thank you Uzma for sharing. I have found out more about that site. They are copying everything from HubPages. File a DMCA with Google. They will shut the site down. @Becky Katz: thank you so much for informing me that my hub has stolen, i checked out the link and it made me very upset. @sgbrown: thank you very much for stopping by and appreciating. yes, pakistan has very unique and interesting culture and i am trying to share it with all of you. thanks again for voting up and sharing. you also have a wonderful day. Your Hub has been stolen. I found it at http://entertainment.bigezine.com/truck-painting-a... This site has been lifting from hubpages a lot lately.